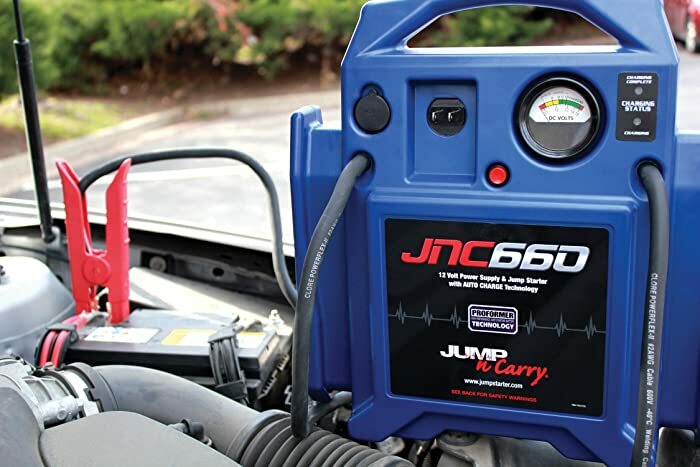 At first look, Jump-N-Carry JNC660 Jump Starter appeared to be everything needed for an at home or light work auto care auto jumper. It is built strong, with the capacity and safety precautions necessary to jump larger vehicles. The first time I hooked it up to jump a small SUV, it had no problems. I let it set for a few minutes to warm up but it turns out that that was not really necessary- the jumper is ready to go right when you need it. The unit literally jumped the car immediately and on the first try. No hiccup, no false start, no sparks flying erratically around. Very impressive. As far as storage, the unit is rather compact and fits nicely onto a basic storage shelf in a garage or similar setup. It stands upright, meaning it will take up not much ground room in your storagae area. From what the brand says, this unit will jump just about anything from small cars to large SUVs and even motor homes. At first I was skeptical, but the JNC660 has yet to fail me. Hooked up to a motor home, the unit revved and kick started the large battery into action. It sat on the battery for a few moments providing some extra juice, and never faltered. The same thing happened when hooked up to a V-10 Ford truck- just a few extra minutes on the jump starter gave the alternator enough juice to get back tonormal drive action. As far as reliable jump starting, what it comes down to is this- if the Jump-N-Carry JNC660 can’t jump it, you have bigger issues than just a dead battery. With 1,700 peak ampere, this device is as strong as any comparable products on the market. The heavy duty #2 cables can reach up to 46 inches- ideal for dead vehicles that may not be ideally close to the charger and unmoveable or at a bad angle. The 12 volt battery is a 22 amp/hour so it will give you 22 amps over and hour while still working just fine. After that, let it charge or rest for a while before attempting to use again. All of these Jump-N-Carry units manufactured after May of 2010 have an auto charge feature, which allows the user the ability to plug the unit in to charge without having to sit there and monitor it the entire time- great for auto workers that are trying to multi-task and get more than one project done on the vehicle. Jump-N-Carry JNC660 will jump just about anything from small cars to large SUVs and even motor homes. The biggest issue with this jump starter is that it is not an energy compliant jumper in California or Oregon, meaning it does not meet the two states’ energy efficiency requirements. The battery status indicator gauge takes a moment to figure out, but once you do it is possible to be on the other side of the garage and still know what the reading is. The only other issue that you may see is on very small vehicles there may be a bit of an energy surplus right off the bat- this charging unit is so powerful and built for dire situations, so just be prepared for a spark or two (low odds, but better to be safe than sorry). The bottom line is that you will not find a more dependable charger on the market. Anything bad that you hear about the Jump-N-Carry is a result of it being too strong or too well prepared to handle a situation, and not because the unit is poorly designed or not built to act in an emergency or convenience setting. Having a unit like this around the shop or home is highly recommended because you never know when something bad is going to happen and the need for an immediate jump start is going to be necessary. The bottom line- if you can’t jump it with the JNC 660, it is not meant to be jumped at all! Be sure to buy one of these units as soon as possible- you will be happy that you did.